They say that every cloud has a silver lining, and so it proved; but little did we know this as we left Le Pellerin for our hurriedly re-arranged destination of La Baule . . . It just so happened that, while chatting to our mate the Marquis, he asked whether we would be visiting La Baule on our trip south. “Well, erm, not really” I replied in my most-knowledgable-about-the-delights-of-France manner. “But oh, you must” he retorted, clearly shocked at our lack of touristic nous to miss out on such a gem of the vacationing variety. 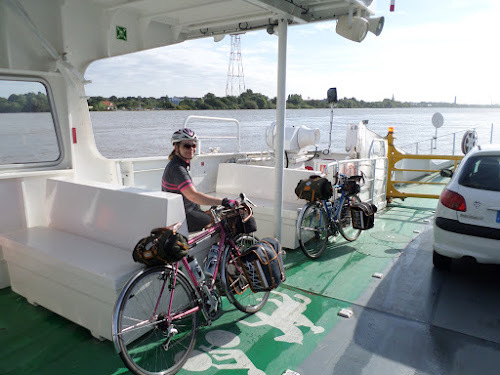 So when, as it came to pass, that we would be leaving the cats early, the pin landed firmly on that part of the map (a real pin on a real map folks, not that bloody irritating google maps virtual pin which I can never get to stick where I want it). 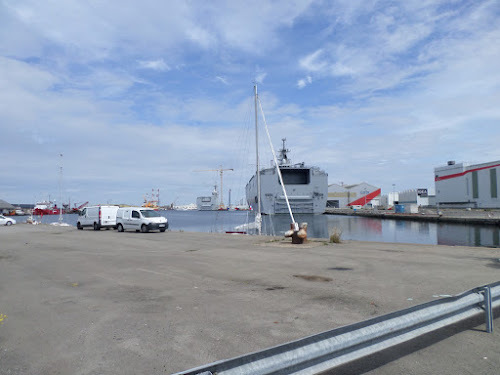 But at least we did see the two becalmed Mistral aircraft carriers in St Nazaire military dockyard – no high wall and razor wire here – which the French built for Putin for he started stomping all over Ukraine and the Yanks said ‘non‘- some you lose eh . . . should stick to flogging jets to the flogging Saudis . 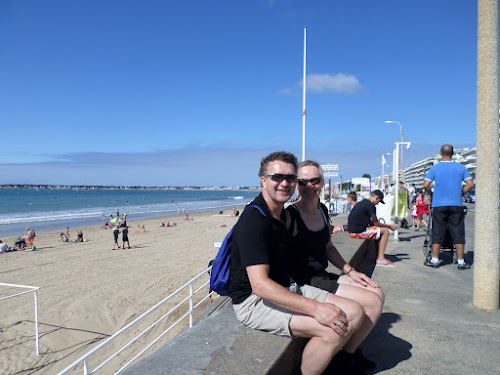 . .
After this, it was a pleasant ride, passing through Saint-Marc-sur-Mer (the location of Monsieur Hulot’s Holiday for all you classic French comedy film buffs who I know avidly read this blog) and on to the bowl of, well, La Baule. 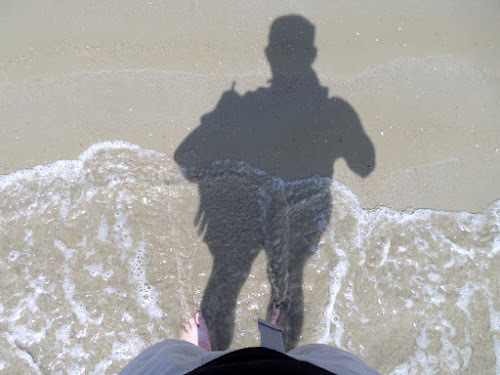 The resort was built to rival Biarritz; not havIng been to the latter I can’t vouch for the veracity of this fact, but it does stretch 9 km along a lovely sandy beach and is packed with what are presumably all of the the people who normally occupy central France taking their vacation. The self catering apartment I had booked is great, so after stocking up the fridge from the local Carrefour, we headed out into the town to indulge in our second favourite activity of these cycling holidays (S contends that I have the order wrong, and who am I to contradict her after reviewing the photographic evidence) . . . le diner at a place called Nossy Be, right on (and I mean right on, practically in the surf) la plage. . . . So today was another rest day with walks along the beach and the inevitable dejeuner. 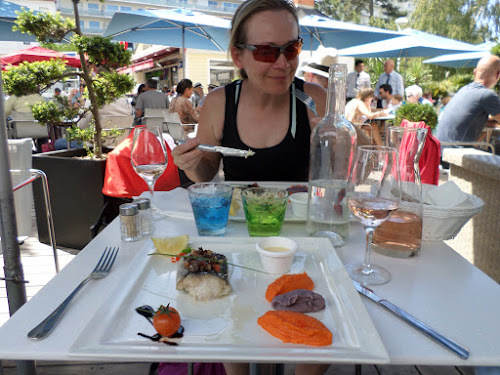 Now, I must say, and S concurs, that this was one of the finest lunches we have had in France – starter, main and glass of wine for €15.90 – maybe not in price but definitely in quality. 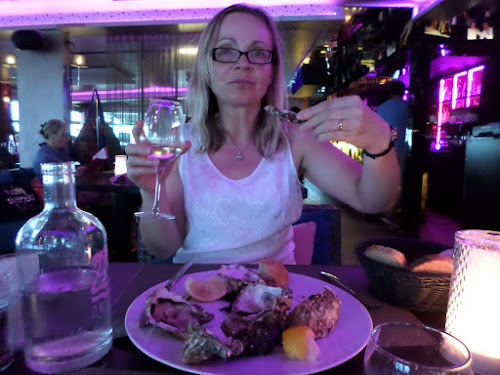 Fierce competion amonget the densely packed restauranters has clearly driven up the noshometer here, so we will be back . . .